Powerful, quiet and durable. Operates doors up to 500 lbs. in weight, provides easy installation and programming, and features dual-pinion drive gear system for extended durability. Deluxe Wall Console Features a security vacation lock and an independent light control with energy saving shut-off. 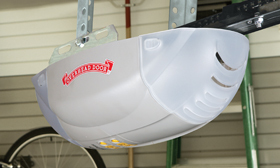 Additional garage door opener accessories are also available. All accessories come with a 1-year limited warranty.